Here, we report the identification and characterization of two novel viruses associated with bird’s-foot trefoil. 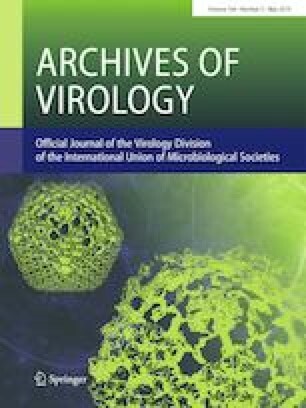 Virus sequences related to those of enamoviruses (ssRNA (+); Luteoviridae; Enamovirus) and nucleorhabdoviruses (ssRNA (-); Rhabdoviridae; Nucleorhabdovirus) were detected in Lotus corniculatus transcriptome data. The genome of the tentatively named “bird’s-foot trefoil-associated virus 1” (BFTV-1) is a 13,626-nt-long negative-sense ssRNA. BFTV-1 encodes six predicted gene products in the antigenome orientation in the canonical order 3′-N-P-P3-M-G-L-5′. The genome of the proposed “bird’s-foot trefoil-associated virus 2” (BFTV-2) is 5,736 nt long with a typical 5΄-PO-P1-2-IGS-P3-P5-3′ enamovirus genome structure. Phylogenetic analysis indicated that BFTV-1 is closely related to datura yellow vein nucleorhabdovirus and that BFTV-2 clusters into a monophyletic lineage of legume-associated enamoviruses. This subclade of highly related and co-divergent legume-associated viruses provides insights into the evolutionary history of the enamoviruses. The online version of this article ( https://doi.org/10.1007/s00705-019-04193-1) contains supplementary material, which is available to authorized users. We would like to express sincere gratitude to the generators of the underlying data used for this work: Dr. Ying Wang and Dr. Zhezhi Wang. By following open access practices and making accessible raw sequence data in public repositories available to the research community, they have promoted the generation of new knowledge and ideas. This research did not receive any specific grant from funding agencies in the public, commercial, or not-for-profit sector.